Shade Umbrellas offer that versatile and tropical look to any garden or entertainment area. For alfresco dining settings to a simple garden setting by the pool an umbrella can be raised, lowered or swung 360 degrees out of the way as you please. These can also be setup as a patio umbrella or garden umbrella to protect against UV rays while you enjoy your outdoor space. Set in solid foundations, our swinging umbrellas are designed and installed to stand the test of time and are engineer rated to withstand 80km winds and carry a five year manufactures warranty against faulty workmanship or parts. The construction is all steel frame and hot dip galvanised coated with Dulux E Primer Epoxy, then top coated to a colour of your choice from the Dulux Powder Coating colour range. Innovative engineering allows all mechanism (winch and cable) to be located within the main pole, giving sleek and tidy external appearance. We use all stainless steel bolts and fasteners. 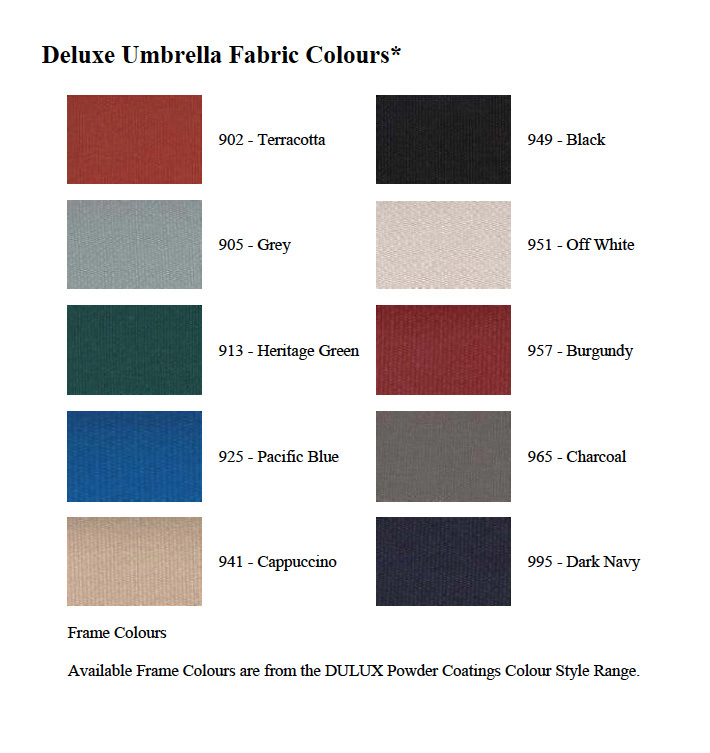 Umbrellas can be skinned in a selection of modern colours in a top quality UV stabilized acrylic canvas, shade cloth as per the specifications in our shade sails or PVC coated polyester as per our PVC page. They are manufactured in either 4, 5 or 6meter diameters. The choice is yours so call or email us for your no obligation Gold Coast Shade Sails Umbrella shade solution by Coastwide Shade Sails. Sails are manufactured from industry recognized commercial grade fabrics. Our preferred brands of shade fabrics are Rainbow Shade ® & Abshade ®. Our preferred brand of PVC Vinyl is Naizil ®. Our sails are manufactured at our facility to exacting standards and are either twin needle sewn or welded (according to the fabric). The corners of each sail are reinforced with the S/S locating rings secured by cross stitched seatbelt webbing to the reinforced corners. 3.2mm stainless steel cable or heavier is double sewn in to the perimeter giving the sail structure it’s strength and tensioning integrity.